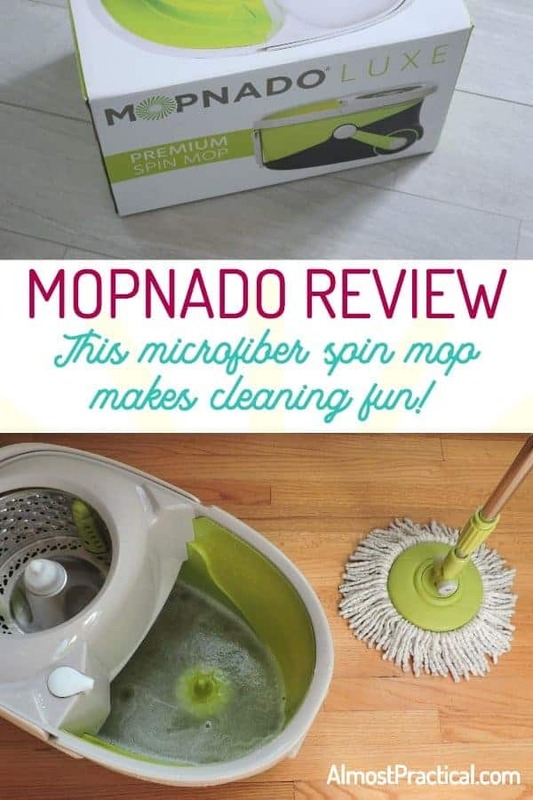 Mopnado Review - This microfiber spin mop makes cleaning fun! Mopnado Review – This microfiber spin mop makes cleaning fun! I am writing this Mopnado review because I want to share my newest favorite cleaning tool with you. In full disclosure, I am an affiliate for Mopnado but I purchased this product on my own and it has really been a game changer for keeping my house clean. 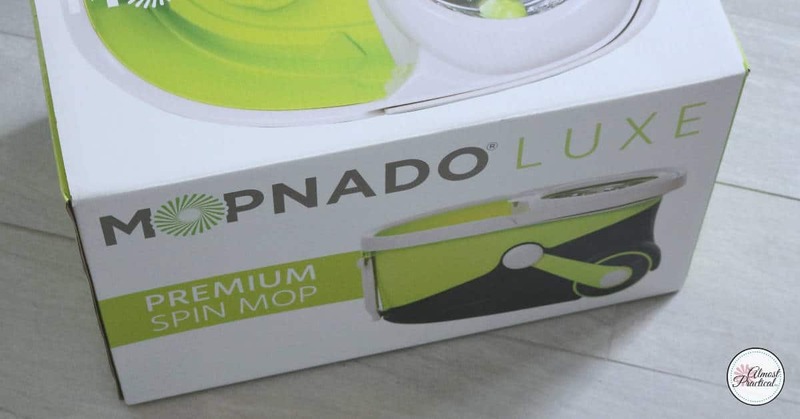 If you are not familiar, Mopnado is a brand of spin mop that is pretty awesome. It has removable and washable microfiber mop heads and a unique spinning bucket that removes excess water from the mop so your floors get clean but not drenched. Because you are an awesome reader of Almost Practical – I have a special Mopnado discount code to share with you today. Simply shop through THIS LINK and use the code PRACTICAL10 at checkout to receive 10% off you order! This offer expires on 11/2/2018 so act fast! I love a clean house. I just don't like cleaning it. Cleaning does not top my list of fun things to do and I'm guessing it's not on yours either. And mopping – well, that has always been a tedious chore. Before I discovered Mopnado, I took lots of shortcuts when it came to cleaning the floor. I went from the lazy – “let's just vacuum and skip the mopping.” to using a spray mop with disposable floor pads to pulling out the big old sponge mop (few and far between, believe me). Mopping was really a thorn in my side. I would spend so much effort on cleaning the whole house, but the floors never got a thorough washing. While the spray mop was good for a super fast clean up – it didn't get all the grime off the floors. Well, if you recall, we recently went through a kitchen remodel. We replaced our old hardwood veneer floors with a beautiful gray tile. And I swore that I would not rely on a spray mop alone in the new kitchen. I figured that I would just get another standard sponge mop but I was afraid that I would fall into my old bad habits of not really using it. Somehow, Mopnado landed on my radar and I started to learn as much as I could about it. The reviews were pretty good. It seemed like a high quality mop that people just loved to use. The Mopnado website even had some detailed videos (and very entertaining, I must add) on how to use this unique spin mop. After spending far too much time researching spin mops (if only I spent that much time actually cleaning the house! 😉 ), I decided to give Mopnado a try. So, I ordered myself a Mopnado system – and I have been very pleased with my decision. Because I am an “all in” kind of person, the system that I ended up getting was the Mopnado Ultimate Value Bundle. It came with the mop handle, four microfiber washable mop heads, a scrub brush attachment, the signature bucket, and a bottle of Mopnado floor cleaner. The first time that I used my Mopnado, I just watched the Mopnado instructions on the videos to get the hang of what to do. Basically, you easily snap the mop head onto the handle with a slight pressure from your foot. You fill the bucket to the fill line with water, add a few squirts of floor cleaner and you are ready to go. To wet your mop, you dunk the mop into the water side of the bucket and pulse the handle down a few times to swish the mop head in the water and saturate the fibers. Then you take the wet mop and place it in the spinner on top of the bucket (it looks like a stainless steel strainer). Again you pulse the mop handle to give the mop a spin. This fast rotation spins off the excess water back into the bucket. You are left with a mop head that is damp enough to clean your floors but not dripping wet. You control how many times you spin the mop – spin it more for a drier mop and less if you want more water in the mop. I use more of a wet mop for my tile floors, but a drier mop for the hardwoods in the rest of the house. Now that I have had my Mopnado for a few months, I have to say that my house feels cleaner than it did before. It works so much better than the leading spray mop that I was using before. In fact, recently, I did a little experiment of my own. I pulled out my old spray mop and cleaned my floors. Immediately after using the spray mop, I washed my floors with my Mopnado. Well, wouldn't you know it, when I finished using the Mopnado spin mop, my bucket of used water was filthy! The spray mop clearly did not clean the floors. But the Mopnado did a bang up job – I'm so happy I got it. Well, in my opinion, there are far more pros than cons. First, it cleans much better than a traditional spray mop. Don't get me wrong – a spray mop is great for spot cleaning – like when Rover traipses across the floor with muddy paws. But for your weekly housecleaning routine, you need something better. Second, Mopnado is sturdy and reusable. At first blush, you might think that a Mopnado system costs more than a spray mop. But when you add it the cost of the disposable pads, the bottles of solution, and the batteries – well, you probably come out ahead with Mopnado. This is because Mopnado uses water and the microfiber mop heads are also machine washable. Third, Mopnado is better for the environment. With Mopnado, you are not throwing away disposable pads and empty bottles of solution. Fourth, Mopnado is easy to use. The mop heads snap on and off with minimal pressure (just be sure to watch the videos to do it correctly). The Mopnado bucket is really easy to fill with water, and really easy to empty. You can fill it in a large sink or a bathtub. I fill it my kitchen sink. Pouring out the used water is easy too. Simply pour down the drain or into the toilet. We have a shower stall in our house, so I just take the bucket in there and pour it down. The bucket itself has wheels so it's easy to move around while you mop. There is also a built in carry handle and a handle for pulling the bucket, too. As for cons, I only have a few. The Mopnado bucket has a little soap type dispenser for your cleaning solution. This is a little hard to fill – but it's really no big deal. 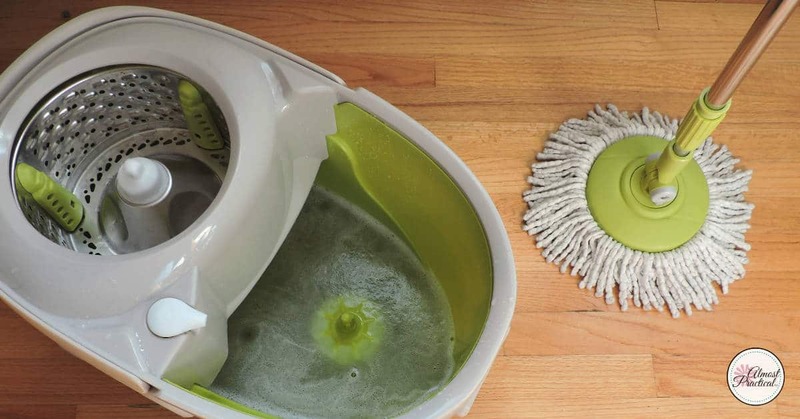 Storage – the Mopnado is not as compact as a spray mop. You will need a place to store the bucket and parts when they are not in use. Honestly – that's about it for cons. 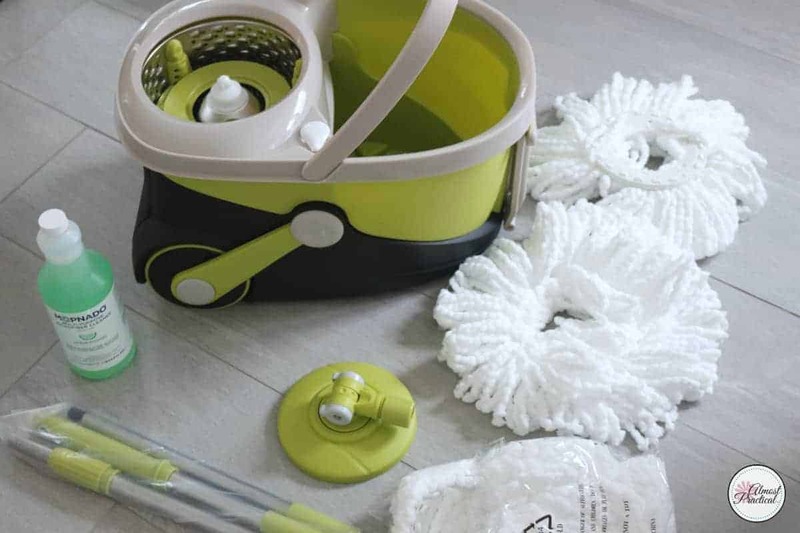 The Mopnado is a solid spin mop that cleans well, is easy to use, and is worth the cost because it uses plain water and the microfiber mop heads are reusable and washable. You can also read through the Mopnado FAQ's or contact them directly if you have more questions. CLICK HERE to learn more about Mopnado.